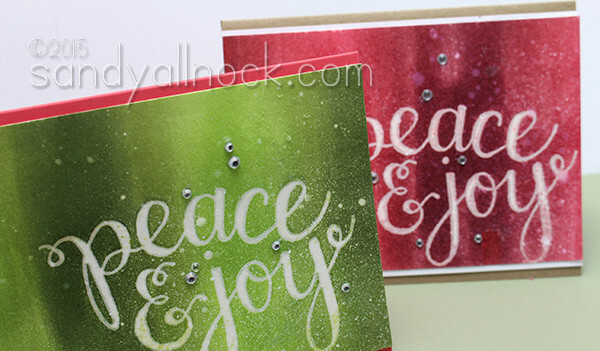 Easy Ombré Holiday Cards – celebrating with Hero Arts! Every year I do a bunch of different things with my holiday cards – I do some easy ones, some middle-of-the-road ones, and some diving-in-and-going-crazy cards. Those are for my “A,” “B,” and “C” lists – based on their appreciation level for handmade cards! Ha! We all have those friends and family who just don’t “get it,” right? So we need quick cards for them. And a little more for those who care about the handmade cards. So today, I bring you cards that would be quick and easy to mass produce in their simplest form…or you can dress them up for the fancier crowd! Watch the video below or click HERE to see it in HD on YouTube. Weren’t those fun and easy!? I wish you could touch them on the letterpress paper and see how soft they are. And ya gotta love the Ombré Green and Ombré Red ink pads! It’s simple to make a background that looks soft and blended – toss a little snow on, and some bling, and it’s all ready for Christmas! I’m just using the clothing iron – that doesn’t really iron clothes anymore. LOL. Glad to hear it’s cooling off! Love your A B C idea for Christmas Cards. That totally works I think! So sorry about PayPal, but anticipate a quick fix as they’ve always been great for me. Love your pretty cards. Last, your shopping wasn’t bad at all. I have been worse ….gulp, gulp…much worse. heh, heh (little confession here!) Love seeing the pic of you in your chair with your cozy shawl and your Apple with neat window beside you! So pretty. The ombré cards are awesome! I totally get the A, B and C cards! Too funny!! I wanted to let you know that I am really enjoying your blog. I’ve been a subscriber on YT for awhile and adore your videos as well. You are also a very good and entertaining writer! Thanks for sharing!! Love these cards you made. I also love that you went shopping and found some nice things. I can see some cute samples in my future. I just spent my shoe allowance on another site. Cannot get anything from Hero Arts today…have to figure out what else I can do without….maybe that cute blouse I was looking at yesterday. Anyway, I love HA new website. Easy to find what you are looking for. Thanks for sharing. What a bummer to have your PayPal messed up. Crossing my fingers that will get fixed pronto. Love these cards a bunch…great colors and ironing off the embossing is such a magical technique. Sandy your artistic skills are amazing! And your effort to provide us with tools is a true blessing! Thank you! and God bless you. Love your cards. I am drooling over those inks. I so the elves stamp in what you bought, which makes me excited can’t wait to what you do with it. So many things I want from Hero arts going to have to start saving. If you get the Copper embossing powder I want to see it on something, I am dying to see what it looks like on someone’s project. I love that you have A, B, Cs for your card recipients! Maybe I should do that too. Instead of getting the dreaded comment “I have too much time on my hands”, they will just get the store bought cards! Ha! Impression (EASY TO DO).IM ALSO IM RESTED HOW GOOD YOU DID AT THE STORE, (I PROBLEMS COULDN’T HAVE THAT MUCH CONTROL)AS FAR AS STORE,PAYPAL HAS BEEN HANG ALOT OF ISSUES,I MY SELFLESS HAD PROBLEMS THIS PASS SATURDAY , DONT WORRY WE WILL BE HERE WHEN FIXED.I ADMIRE U AS ALWAYS. I totally understand A, B and C. Some people appreciate it just so much and others will just put in trash. Great “A” level cards! I already have those ombre ink pads on my wish list, but hadn’t thought far enough ahead to plan cards for them – now I know what I’ll be doing – thanks! Oh, and I’m totally jealous of you – getting to “Hero” shop – wish I could go, too! Pretty! I hear you about the A, B, C level of card, although anyone who wouldn’t be appreciative of something you’ve created probably needs to have a time-out with intensive craft therapy–lock em in a room with lots of paper, stamps and tape runners and don’t release em until a couple of cards have been created! THEN there will be a new appreciation for cards! Thanks again for all your stellar work in producing videos for our crafty community!